This weekend, I have been working on several home projects that I can’t wait to share with you. I am almost finished with the upstairs bonus room, and I can’t wait to give you a tour. For today, though, I thought I would give you a Summer Tour of my living room. I gave you a short tour in my first blog, but I wanted to give you a more in depth tour of the room today. With the warmer temperatures, I have been staying indoors and have been changing up some of my table vignettes. I decided to change up the coffee table. I moved my Staffordshire dogs to another area and replaced them with these antique candlesticks. My fireplace mantle is not very large so I tend to keep it simple in the Summer months. This is a view of the loveseat area of the living room. This table belonged to my grandmother. She gave it to me when I got married. It was always in her living room and is something that I treasure. I could never part with it. This is an accent chair that I recently had recovered in a Jacobean print fabric. Below on my blue and white garden stool is a pair of antique French Opera Glasses. This cabinet is seen as you enter the living room. Thanks so much for stopping by! I hope that you have a great Monday!!! What a charming home you have! French Country is so cozy and pretty. I love all the different elements in your room. The pillow which matches the chair is a lovely touch and something I like to do too. Love your tables! I have painted all my tables white and turned them into cottage chic as they had gotten quite beaten up over the years. Your blue and white china is beautiful. I really enjoyed my visit and thank you so much for linking up with me. Enjoy your day. Sandi, thank you so much for your very sweet and gracious comments. I’m so glad that you enjoyed the tour and thanks so much for hosting the party. I hope that you have a wonderful week! Is that a brooch I see pinned to one of your lampshades? I too have been known to pin a butterfly or bee from a lampshade! I learned that from a lady at a beautiful B&B in Normandy. She also wrapped a silk scarf over an ancient wood chair. Thank you Ana Maria! Yes, that is a brooch. It came with the lampshade, and that is why I bought it. I love the way it added an extra touch to the lamp. I’m so glad that you stopped by, and I hope that you have a wonderful day!!! As Sandi said, you have a charming home. Love the bookcases. I’ve been looking at them as we are planning to do built-ins. Love the height of size of yours. They really make the room. I’m your newest follower. Thank you so much your sweet and gracious comments. I’m so glad that you are my newest follower. I’ve been blogging for a little over a month, and I am having a great time and enjoy hearing from everyone. I’m so glad that you stopped by, and I hope that you have a wonderful day!!! Thank you so much Pam! I’m so glad that you stopped by and enjoyed the tour. I hope that you have a wonderful week! A most beautiful room Shannon…I am loving all of the blue and white! Summer perfection! Thank you so much Martha! I’m so glad that you stopped by, and I hope that you have a wonderful week!!! Thank you so much Christie! I’m so glad that you stopped by, and I hope that you have a wonderful day!!! I love your room. The rug is beautiful, and a great anchor for the room. Really pretty!! Thank you for your sweet comments Kathy! I’m so glad that you stopped by, and I hope that you have a wonderful day!!! What a pretty summer living room and you have so many beautiful pieces! Thank you so much Tara! I’m so glad that you stopped by, and I hope that you have a wonderful day!!! Thanks you so much Stacey for the very sweet comments. I know what you mean about arranging furniture is this style of room. It has been a very difficult challenge. I have had furniture in this room styled several different ways, and this arrangement worked out the best. I hope that you have a great day and a wonderful weekend!!! What a lovely traditional home you have. Thanks for sharing your lovely living area. Thank you so much Bernideen! I hope that you have a great day and a wonderful weekend! Thank you so much Kathryn! How exciting!!! I’ll be back tomorrow night. Thanks again for hosting the party!!! 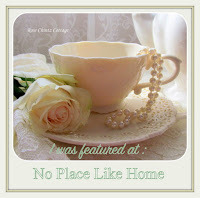 Just took the tour of your living room…so serene and pretty! Love that the small table is from your Grandmother. That’s what makes a house a home. Also the pretty Jacobean recovered chair is to die for! Well done! Hi Catherine! Thanks so much for your very sweet and kind comments. I’m so happy that you stopped by and enjoyed the tour. Both the table and the Jacobean chair are my favorites too! I hope that you have a blessed and wonderful day!